I still have a few A England shades to share with you and what better occasion than the Holiday season to feature beautiful shimmers and glitters? The legendary, magnificent sword of King Arthur. Attributed with supernatural powers. The symbol of supreme grace with miracolous power whose quest is the highest spiritual pursuit. Excalibur isn't your typical silver foil. Actually sort of looks like a foil but I would rather call it a textured metallic. It reminds me of those intense metallic silver marker pens I used to have : so sparkly and opaque, unlike any of my other foils. Fromula was just perfection, opaque in one coat, saturated to the max and brushstrokes free. If you love silver nail polish, there's no hesitation you need Excalibur in your life, if only for nail art or stamping. Holy Grail is an intense yellow based gold metallic. Formula was different from Excalibur and required a second coat but applied nicely and evenly for a fast drying finish. I'm usually not a fan of gold polish but I find myself liking it more every day and Holy Grail's antique sparkle is spectacular. A England retails for £9 each on a-england.co.uk, free worldwide delivery, and currently offers a holiday promo with "Merry Crowns" : 2 shades for £13 (saving £5) until 6 January 2012. And if you're not familiar with the lovely Adina yet, creator of A England, you can follow her on both Facebook or Twitter. oh yeah,they are both gorgeous! These are just WOW! I especially like the first one. I love both of these colors. The gold is very beautiful. I always love the A england swatches people post! i dont own any yet but i want to! they always look so gorgeous! I love Excalibur. So gorgeous! 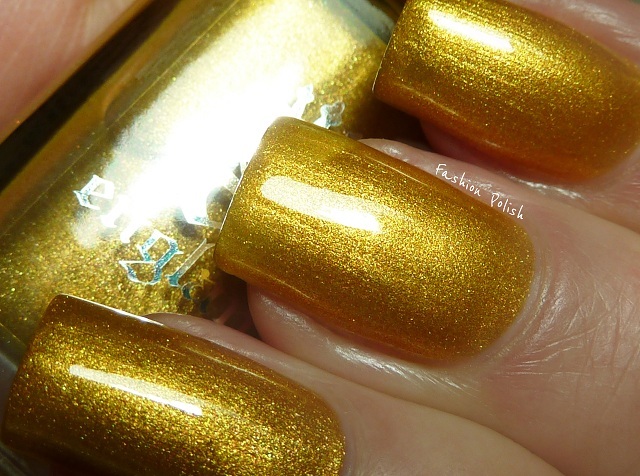 This Holy Grail nail polish is so tempting to buy...It's like a Murano glass gold. Very nice nail polish! I would love one too!